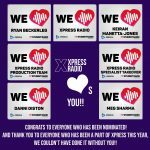 On the 15th January 2019, Xpress Radio held a relocation fundraiser at Gwdihw Cafe Bar to raise money to safeguard the future of the well-loved and established venue at Guildford Crescent, amongst threats of demolition and destruction of the local businesses and subsequently the communities and homes of families who live there. The evening opened with Rhys Dafis, a member of Xpress Radio who performed a stripped back acoustic set including various Welsh songs, and covers from the likes of Simon and Garfunkel and others. This was followed by another acoustic set by two members of Al Moses – Jack & Daf, who performed various songs and their popular single “I Want More”. The final two bands included Crystalline, a female fronted student rock band who formed whilst at university here in Cardiff, and local Cardiff band Charlie Says, fronted by Alcie Bela, concluding the night with songs exuding power, energy, and passion behind this important cause – and of course, the Gwdhi-Bag, won by Andrew Locke-Scobie! Thank you so much to everyone who came along to the event to support this wonderful venue, or those who managed to come to the march for Guildford Crescent on the 19th. We managed to raise over £300 in donations on the night, all going to the great cause of saving and relocating Gwdihw.